Even though gas saws are the most potent, electric Corded and Cordless chainsaws offer so much convenience. They are lighter, more portable, quiet, and easier to maintain. Above all, these saws are Eco-friendly because they don’t burn fuel like gas engines. But what’s the best electric chainsaw? Today’ market is flooded with so many brands and hundreds of models. That makes shopping quite a demanding task, especially for first-time buyers. There are so many factors and features you need to consider; from the corded chainsaws to the cordless options. Today, we reviewed the best electric power saws in the market, and after that, you will find a detailed guide on how to choose your chainsaw. So, without further ado, let’s get to business. Electric chainsaw for cutting firewood? If you want a saw that you can use for long without interruption, then get a corded chainsaw. As the name suggests, it has a power cord that connects it to the mains. Here are the top 5 best corded electric chainsaws in the market. This chainsaw boasts a 15-amp motor which is quite impressive though it seems the marketing is misleading. The motor has been rated 4 hp which is impractical considering it is rated 1,800W. From the formula power in watts = volts x amps, it’s clear that it’s slightly above 2hp which is still fine. Tagged along is an Oregon 18-inch bar with kickback reduction. The low profile 0.05” gauge is quite detailed with 63 links and has an amazing 12m/s speed making the chainsaw ideal for light duty as well as heavy duty tasks. One of the unique features of this chainsaw is the Patented auto-tension chain system. It also has a tool-less chain tension adjustment courtesy of a large knob. The chainsaw also has an automatic chain oiling system which makes the chain movement efficient. When it comes to usability and safety, the WORX WG304.1 is ergonomic and highly maneuverable. Other features include a chain brake that doubles up as the front hand guard, a rear handguard, throttle switch, and lock-off button. The bar also has reduced kickback whereas the dog spikes add stability. There are a few things we didn’t like about WORX. First, the oil leaks seem something normal for WORX such that they recommend emptying the tank when not in use. That means they understand the chainsaw has a leaking problem in almost all the units. The gears are plastic and won’t last long if you submit it to daily heavy duty cutting. Worse enough, replacement gears are not readily available. As the name suggests, this chainsaw is designed for trimming, residential limbing and other lightweight cutting needs. 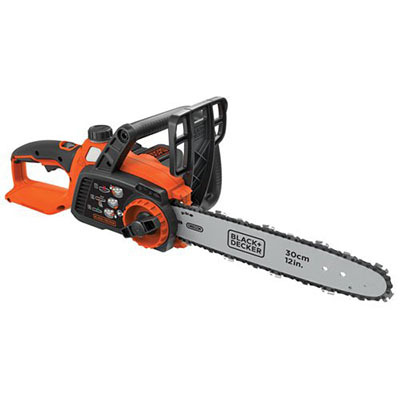 Besides that, it is a great chainsaw for amateurs courtesy of the lightweight design and easy maneuverability. It weighs only 6.25 lbs. making it among the lightest corded chainsaws in the market. It has minimal vibration and besides, the padded handles help dampen the vibrations. The price is also very affordable making it a great place to start for amateurs. The Remington RM1425 is a small chainsaw but has quite a large bar for its size. This is a 14-inch chainsaw that packs an 8 Amp 120V motor under the hood. Definitely, it’s not that chainsaw you can depend on heavy logging or daily use. It is perfect for the once in a while cutter or a quick cutting solution for the DIY enthusiast. Among the safety features, this chainsaw boasts include a wraparound front hand guard which is also the chain brake. The cover design is 100% shield against chain impact. The bar has a low kickback, but it doesn’t guarantee 100% protection against kickback occurrence. Unfortunately, this chainsaw doesn’t have an automatic chain oiler. You have to manually lubricate the chain with a button that is not precise with the application. It also means lesser productivity considering you have to stop after a few cuts to check the chain. Its use is also limited to light duty cutting because of the small motor. But for the price, it is still a great deal, but definitely not for the busy home! This Makita 16-inch chainsaw is what you need if you want the perfect blend of power and durability. The Makita UC4051A boasts a rugged design that allows it to be used in extreme conditions. It’s able to withstand the cold winter temperatures when cutting your Christmas tree or clearing a fallen tree. Its performance is also heavy duty, and it’s ready to handle a range of heavy-duty domestic cutting needs. A solid 15 Amp motor that cranks the Makita UC4051A and to protect it from burning out when used for long, it has a current limiter. Starting and operation is very smooth and thanks to the 14.7m/s chain speed, you can cut through a range of wood pieces swiftly. The 16-inch bar is enough to fell small to medium trees occasionally and can comfortably handle firewood. Another thing we liked in this chainsaw is the handling. First, the front and rear handle have soft rubber that gives you a tight and comfortable grip. The solid construction on the other hand greatly reduces vibration. The front and rear handles are rated at 5.2 m/s2 and 3.9 m/s2 respectively. Maintenance couldn’t be any easier courtesy of the tool-less chain tension and blade adjustment. On the downside, this chainsaw is somewhat heavier. At 13 lbs. it’s not something you can comfortably use to cut stuff away from the ground. If you want the best affordable corded chainsaw for home use, the Poulan PL1416 should be number one on your wish list. Even though Poulan is not the most popular brand, this 14-inch chainsaw is the best for most kinds of domestic cutting needs. The 16-inch bar is big enough to cut firewood, fell small trees, DIY projects and so on. I’m also glad the 14 Amp power matches some of the heavy-duty chainsaws like Makita UC4051A and WORX WG304.1 and is cheaper. It’s actually priced almost the same as Remington 1425A, but this one is much powerful. The ergonomics of Poulan 1416 is just amazing. The inline engine design gives you a steady grip on the top handle. It’s also negligibly lighter than WORX and Makita so if among your tasks include pruning, this should be a priority as it’s lighter. Another thing we liked about Poulan is the fact that you can easily swap bars. It can easily accommodate a 12, 14, 16 and 18-inch bar. Among the problems we found with this chainsaw is the rather uncomfortable handles. Neither handles are padded so you can feel all the vibrations. The hard plastic is also sweaty in hot weather and doesn’t offer a tight grip. The construction is also not up to the mark. The cheap plastic material is less durable and gets scratched easily. Lastly, the chain tension needs frequent adjustment. Among these heavy duty chainsaws, I can say that Black+Decker CS1518 is the safest because of the small radius tip that drastically reduces the risk of kickback. It also runs on an ANSI B.175.1-certified low-kickback chain. A lock-off button is also included for a two-step verification to prevent accidental throttling. Apart from these, the chainsaw packs all the rest of the standard chainsaw safety features like chain brake and hand guards. Retailing at under $100, we find it an excellent value for money. The Black+Decker CS1518 is an 18-inch corded chainsaw that is perfect for those light to heavy-duty cutting tasks, even if they are continuous. The Oregon bar enables it to slice hardwood without bending like most bars. It is powered by a 15 Amp motor that delivers 1800W which is equivalent to 2.4hp. The nose sprocket design and 12.5m/s chain speed makes cutting effortless regardless of the type of wood. The chain also has an unusual number of drive links; 62 just like WORX WG304.1 which has 63. We also liked the quiet operation which was barely 86db when the average for other similar chainsaws is way above 90dB. When it comes to usability, the bumper spikes is a something you want to have especially when splitting logs in wet conditions. The spikes plunge into the wood giving you more stability. Maintenance is not a big deal as it comes with a self-lubricating chain and bar. The chain tension adjustment can be made without any tools also. For those who have projects in remote areas with no access to electricity, the cordless models will be the best. These come with internal batteries that power the engine. Here is our shortlist of the top 4 best cordless chainsaws. This is an entry level cordless chainsaw that features a 40V lithium-ion rechargeable battery rated at 2.0AH. The chainsaw can handle all the light duty domestic cutting needs. 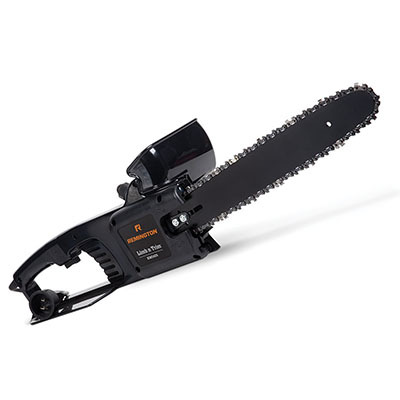 With a 7.62m/s chain speed, and tough Oregon 12-inch bar it can handle a range of tasks from pruning branches, limbing, hedge and shrub trimming, and maybe light woodworking projects. While the stock battery may last you anything from 30 – 40 minutes, you can opt for an extra battery to boost productivity. The high-efficiency brushless motor is very potent and operates on low noise. The handling is not so good because of the heavy 10 lbs. weight but I’m glad the handle and throttle are ergonomic and comfortable. At least you can have a tight grip on the machine for better maneuverability. Chain tension adjustment doesn’t require any tools, and when required, the large adjustment knob makes it quick and easy. With this chainsaw, safety is paramount as it comes with a reduced kickback bar and a chain brake. The vibrations are dampened by the strong body and padded handles to relieve pressure upon long use. One of the problems with this chainsaw is the rather generous automatic chain oiler. It drips excess oil, and even though this is good for efficient cutting, you have to fill the tank frequently as it’s small. It’s also not dependable for cutting thick logs or prolonged use. The price is a little bit on the higher end also considering GreenWorks and several other brands offer bigger models at a lower cost. Among the most innovative brands, GreenWorks made it in our list courtesy of the GreenWorks 20312, a model that features the DigiPro brushless motor design that is 30% more efficient and experiences no voltage drop because of friction. The design also makes it durable and reduces vibrations by up to 70%. 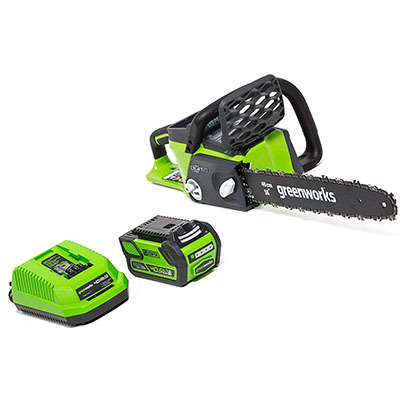 This GreenWorks 20312 is fired by a powerful 40V 4AH battery that can yield up to 100 cuts. The electric start is on point and doesn’t fail even in the cold mornings like gas chainsaws and some cheap cordless models. GreenWorks 20312 comes with a 16-inch Oregon bar which makes the chainsaw ideal for a range of home cutting needs. The chain speed is 11m/s which is not the best, but for the price, we can’t complain. This chainsaw can be used for cutting firewood, limbing, felling small trees, pruning and so much more. The cordless design, on the other hand, makes it perfect for remote use as you are not limited on usage location. Other features include automatic oiling, chain brake, rear and front hand guard, and bucking spikes. One problem we noticed is that the chain stretched as we used it but thanks to the chain tension adjustment knob, you can set it properly. It’s also bulky at 13.3 lbs. compared to other chainsaws in a similar range. It also leaks oil, so you have to empty the tank before storage. If you want a cordless chainsaw that can match the performance of the heavy-duty corded models, them this DEWALT FLEXVOLT chainsaw will be a great choice. It packs a powerful 60V lithium-ion battery and delivers 3.0AH meaning you can do some reasonable amount of cutting before you recharge it. Even though it’s costly at over $500, it is great value for money now that you don’t have to mind power cords and extension cords. Another thing, the batteries are also available in 6.0AH and 9.0AH. Besides the longer run time, the performance is splendid. The chainsaw has a premium 16-inch Oregon bar that can handle all the domestic cutting needs. You can fell trees occasionally, cut firewood, prune branches among so many other tasks. DEWALT DCCS670X1 FLEXVOLT® packs several safety features including a large hand guard that doubles up as the chain brake and low kickback bar. You can adjust the chain without any tools while the chain gets oiled automatically. You only need to fill the tank when it’s empty. Fortunately for this model, you can store it with oil inside as it doesn’t leak. We didn’t find any major problem with this chainsaw except for the high price tag. Clearly, you get what you pay for. You can also consider buying the chainsaw alone and get a battery separately. 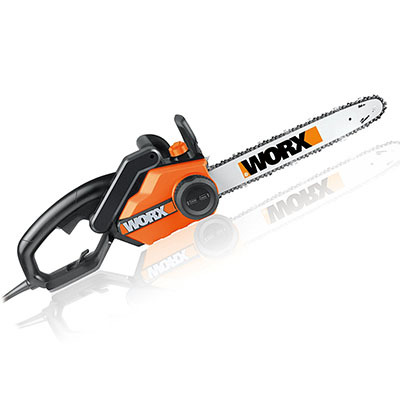 If you are looking for a light duty cordless chainsaw, then get the Worx-WG322. It boasts a lightweight design at 6lbs. making it easy to handle and maneuver. The handling is excellent and quite comfortable even for amateurs to maneuver. Safety is up to the mark as it included a large hand guard, chain brake, and low kickback Oregon bar. The performance is quite okay for a light duty cordless chainsaw. It comes with a strong and sturdy 10-inch bar and 40-link chain ideal for light cutting. It is easy and straightforward to install and requires no tools at all. Chain tension adjustment can also be made without any tool, so you are free to roam without carrying your toolbox. 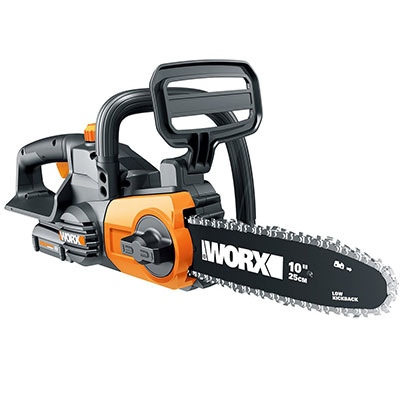 With a 20V battery rated at 5.0AH, the Worx-WG322 is an excellent companion for gardeners, florists, DIY enthusiasts and any woodworker who wants a light duty and maintenance free chainsaw. One of the downsides of this chainsaw is the rather long charging time. Even though you will have quite a long runtime, the charging time will ground you for longer as well so an extra battery is indispensable. Another thing, the bar is only 10 inches long meaning you can’t rely on the Worx-WG322 for heavy duty tasks. But it’s a compact chainsaw anyone can easily use in the garden or at home. Armed with the list of the top models in each category, you are good to go. But there’s one thing you need to note. The top models today may not be the top models tomorrow. Our advice is that you learn how to select the best chainsaw. That is what this electric chainsaw buying guide is all about. We will discuss every important aspect you need to be aware of when buying a chainsaw. As the name suggests, an electric chainsaw runs on an electric motor and is powered by electricity as opposed to gasoline in gas chainsaws. Electric saws may not be as popular as their gas counterparts but are steadily gaining popularity among homeowners. Interestingly, electric chainsaws were introduced before the gas engine saws. STIHL was the first company to manufacture an electric chainsaw in 1926. A few years later, German brand Dolmar introduced the first gas chainsaw. After you’ve settled for an electric chainsaw, you will still have the dilemma of choosing between a corded chainsaw and a cordless chainsaw. The difference between these electric saws is their source of power. But recently, we have also seen several other categorizations of electric chainsaws based on their duty and handle type. This is the basic categorization of electric chainsaws. The cordless type come with inbuilt batteries that power the motor while the corded chainsaw has a power cord that feeds the motor from a mains socket. Corded chainsaws are generally more potent than their cordless counterparts and offer continuous use as long as you have electricity. If you are searching for a chainsaw for medium to heavy-duty use, you probably need a corded chainsaw. The problem with these saws is that they limit you where you can work as the power cords are not very long. Cordless chainsaws, on the other hand, are ideal for remote use. You don’t have to worry about electricity mains of the cord tangling. However, these chainsaws are less powerful and don’t offer continuous use like the corded options. This is another categorization of electric chainsaws based on where the handle is located. The rear handle chainsaws are the most common type and are used to cut in the ground direction. They offer a better grip and consequently, better maneuverability. If you are looking for a versatile cutting tool, this is your match. The top-handle chainsaw is the best for tree care. But it lacks versatility in that there are a few other applications apart from lawn care. This chainsaw is for the pros so if you are an amateur it’s not something you want to experiment with. If you are window shopping for the best electric chainsaw, but you don’t know the key features to assess, here is a detailed guide. We have discussed all the essential aspects you should consider when choosing an electric chainsaw. The basic fundamental when learning how to use a chainsaw is the handling. How you handle the chainsaw really matters but also, the chainsaw design matters too. Here are critical aspects to look at when buying your chainsaw. Weight – The weight of the chainsaw should be proportional to your physique and power. If you have enough power, then you shouldn’t worry about the weight of the chainsaw. However, if you want something that is easy to use, start with a lightweight chainsaw. Anti-vibration – If you have used a chainsaw, you understand how intense the vibrations are when you are not used to it. These vibrations are so dangerous and often lead to hand-arm vibration syndrome with prolonged use. When scouting for a chainsaw, make sure you get one that has an anti-vibration system. Basically, this is the incorporation of a sturdy design and rubber bushes and springs in place to absorb the vibrations. Fortunately, most of the models have this feature since it was invented as early as 1974. But I strongly recommend Husqvarna models. Handling – The top and rear handle should all be ergonomic and offer a tight and comfortable grip. The padding should also be able to absorb the vibrations. The most important consideration when buying a chainsaw is the performance. This is regardless of whether you are buying a gas chainsaw or an electric. Here, there are three significant considerations; power, bar guide, and chain speed. Power – The power of a chainsaw is the most important aspect, and this generally refers to the output of the motor. Most of the corded chainsaws will be rated in amps-hour and the more the amps, the longer the chainsaw will run. On the other hand, cordless chainsaws introduce yet another new term called voltage and the higher the voltage, the better the performance. Bar – This is the large protrusion that houses the chain. When selecting a chainsaw, make sure to go for a sturdy and robust bar, with Oregon being our recommendation. Electric chainsaws are available in 6-inch bars to 18-inch bars. Apart from the bar strength, you need to be very selective on the bar length. If you have bigger logs to cut, you need a bigger bar, probably a 16-inch or 18-inch bar. However, if you have light tasks like limbing, pruning and cutting light firewood, you may go for a smaller bar. Chain – There are three types of chains; chisel, semi-chisel, and kickback chains. Kickback chains are safe when it comes to kickbacks but are not efficient. On the other hand, chisel-shaped chainsaws are efficient but unsafe. There is the third option called semi-chisel chain, and this is a blend between the two. At least it is kickback safe and doesn’t compromise output. The chain speed is also essential, and one thing to note here is that the higher the chain speed, the faster and easier the cut. Automatic chain oiler – Your chainsaw requires frequent chain lubrication. The different sawing conditions need different levels of lubrication. While many chainsaws have a chain lubrication trigger for releasing the oil, get a chainsaw with automatic oiling for better usability and improved productivity. Tool-free chain adjuster – From time to time, your chain tension will require adjustment. To get the best experience with your chainsaw, go for one that offers tool-less chain adjustment. Oil tank capacity – The chain lubrication oil tank should be large enough to hold a considerable amount. A larger oil tank means you will work for longer without interruptions. A clear oil tank is also desirable. See-through oil level – The chain is regulated by an oiling system that can be manually operated or automatic. A chainsaw with a see-through tank will come in handy in reminding you when it’s time to refill. Case – The case is important as it shields the bar from the detrimental conditions that may lead to rusting. It’s also safer having the case on when storing the chainsaw. Chainsaws are great when it comes to simplifying those huge cutting tasks. Whether you are on a simple woodworking DIY project or felling and pruning forests, their input is invaluable. However, this equipment can turn out to be very dangerous. Every year, there are massive casualties form chainsaw accidents. Kickback is among the gravest risks when using a chainsaw. Fortunately, several features can help you stay on the safe side when using a chainsaw. Chain catcher – This is a strong and sturdy metal or plastic guard that prevents the chain from coming into contact with the operator’s hand in case of chain breaks. It quickly arrests the chains immediately it breaks thus averting injuries. Chain brake – Introduced in 1972, this safety feature makes sure the chain stops when you stop the chainsaw. This part is on the top handle of the saw, and the braking can be engaged by either manually pushing the handle forward or automatically when kickback occurs. Anti-kickback chains – Though not common, these chains are specially designed to reduce the force of kickback. Kickback brake – This feature stops the unit immediately the chain engages a resistance. Safety throttle – When you haven’t switched off the chainsaw, there is a chance that the throttle can be pulled. The safety throttle temporarily locks the chain canceling out the risk of injuries from accidental acceleration. Current limiter – The motor is the most expensive component of the chainsaw and is bound to overheat. When it overheats, it risks burning out, so a current limiter is included to put it off when it overheats lest it burns out. Sometimes, your chainsaw may develop a problem that you can’t troubleshoot. If it’s under warranty, you are fortunate because the warranty will fix it. That said, you need to make sure the chainsaw you buy has a genuine warranty. And of course, it should belong. When it comes to after sales, go for a chainsaw that you are sure of getting parts and accessories. The best you can do is to go for those top brands. While they may look expensive, they are better than these cheap brands which hardly have spares in the market. Maybe you still haven’t found your match even after going through the technical checklist. Just to help you further, we compiled some of the major chainsaw needs and explained the important issues to consider when buying. There are several cutting tasks that you will need a chainsaw for at home. These include cutting firewood, pruning tree branches, felling small trees, DIY projects and so on. No one electric chainsaw will do all the tasks that will come along. However, there’s always that one chainsaw that can handle most of the tasks. Here, we recommend a heavy-duty electric chainsaw with a 16-inch bar. At least this one will handle all the medium-duty to heavy-duty cutting tasks. With a 16-inch rear handle chainsaw, you can comfortably cut a month’s long firewood. That means the chainsaw has to be corded to provide continuous power supply. Regarding power and performance, settle for anything in the region of 2000W as this is enough power to handle most of the domestic cutting needs. Basically, we are trying to front the most powerful corded chainsaw to make sure that it covers all your cutting tasks. You’d rather have more power and not need it than need it when you don’t have it. Our recommendations here include; Poulan PL1416, Black & Decker CS1518, Tonino Lamborghini KS6024 among other 14-inch and 16-inch chainsaws. Cutting firewood is among the most common domestic cutting needs. When shopping for an electric chainsaw for cutting firewood, you need to make several critical decisions. This is because cutting firewood is such a demanding task depending on the size of the logs you are splitting and cutting and also, the frequency or amount of firewood you are cutting. The bottom line when choosing a firewood chainsaw is that it’s a heavy duty task. For that reason, we strongly recommend the heavy duty electric chainsaw. Basically, this is something with a large bar, probably 16-inch and powerful output, maybe 2000 – 2400W. Regarding the type of electric chainsaw, settle for nothing less than a corded chainsaw because you want continuous power. Some of our recommendations here include Makita UC4051A, and Poulan PL1416, with a 16-inch bar and WORX WG304 that comes with an 18-inch bar. We all love hardwood because of the durability. But for loggers, cutting or splitting hardwood is a nightmare. Hardwood is hard to cut, and not just any chainsaw can manage the toughness. When shopping for a chainsaw for hardwood, there are important things you need to know. First, go for a corded chainsaw because of the continuous power supply and high performance. As usual, a high power motor is the best, maybe with 2400W or even higher. Tonino Lamborghini and Oregon CS1500 are great options here; they have 2400W. The next thing you need to look out for is high chain speed. You understand that the higher the speed of the chain, the more efficient the cut. Different chainsaws offer different chain speeds so while you consider power, remember that chain speed too is important. Often, you will have to sacrifice between chain speed and power because it’s not in all cases where power is proportional to chain speed. Einhell GE-EC 2240 is a great bargain here because it packs a 2200W / 240V motor and 15m/s chin speed. Makita UC4051A is also a top consideration with a 14.5m/s chain speed and 2000W. A longer bar is also best because it’s stronger and won’t bend easily when inside the wood. Chainsaws are not only for cutting wood, but they are also used in the construction industry to cut stone as well as in masonry. Concrete chainsaws are designed to cut concrete but can also be used on wood and other surfaces. When shopping for such a saw, there are several things you need to look out for. First, make sure you buy a chainsaw with a diamond grit as any other ordinary steel chain won’t withstand the hardness of concrete. A water tank for cooling the chain when it gets too hot is also a requirement for such a saw. A filter is also necessary to ensure the small shredded concrete particles don’t get to the inner components of the chainsaw, especially if it’s a gas chainsaw. Away from the special features, gas chainsaws are the best for cutting concrete because of their immense power. However, electric chainsaws also come in handy and here, you must aim for high power, and high chain speed. One of the electric chainsaws we recommend for concrete is the Cocodrillo CD35. But it is not best for everyday use so if you are a professional looking for the best concrete chainsaw, get a gas engine chainsaw like Husqvarna K760 or STIHL GS461. Even though we have said that chainsaws are very dangerous, there is no danger when it’s used in the right way. Another crucial safety aspect is wearing the right PPE gear. There are five crucial safety gear that you should not miss when working with your chainsaw. These are worn on the hands and work to dampen the excess vibration on your hands. Gloves also prevent cuts during accidents. They should be water resistant and durable to withstand the harshest weather conditions. These are special trousers that protect the lower limbs from cuts. These chaps are crafted with six to nine layers of hard and protective material. Good chainsaw chaps should have an adjustable wait with enough straps to keep them in place. You also want an open-back design to at least keep you fresh when working in hot weather. Your head is the most critical part, so you need to cover up in a professional chainsaw helmet. Make sure you go for one that comes with adjustable and removable earmuffs. The top material should be hard enough and preferably UV-resistant. The gear should also be lightweight and have a mesh visor. You also need a pair of safety goggles that comfortably fit you without compromising your clear vision. These goggles protect your eyes from the flying debris and make sure that you are confident enough to look at the cut. While the firm grip of the chainsaw is imperative, you also need to be stable on the ground. Make sure to wear work boots when using the chainsaw to prevent slipping and even injuries. What’s the difference between volts and amps in electric chainsaws? When assessing the power performance of a chainsaw and power tools in general, these two terms are often confusing. Well, amp-hour refers to the time your chainsaw will run before the battery becomes depleted. Voltage is introduced in cordless chainsaws and points to the power a chainsaw will have. However, you need to use the exact battery voltage. For example, if your saw is rated 18V, you should use an 18V battery, but you realize, the amp rating of two 18V batteries may be different. How do I safely use a chainsaw? Chainsaws are very dangerous but when abused only. To be safe, it’s vital that you wear the correct gear. These included goggles, ear muffs, helmet, chaps, and boots. Even when you are in the right gear, make sure to use the chainsaw for the intended task. A lot of accidents occur when the chainsaw is being used on the wrong job. For example, cutting through hard surfaces may trigger kickbacks. Lastly, make sure your chainsaw is always in top-notch condition. Sharpen the chain, adjust the tension and regularly lubricate the bar guide and chain. Is it safe to use an outdoor extension cord with my electric chainsaw? Yes, you can extend your work zone by buying extensions cords. However, be very careful with the type of extension cord you pick because not all cables in the market are designed for the same purpose. When it comes to corded chainsaws, you have to match an extension cord depending on the amperage as well as the length. The wrong cable risks burning out your motor. 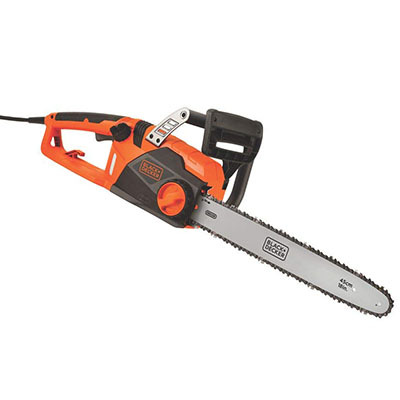 So, what’s the recommended extension cord for electric chainsaws? When it comes to outdoor extension cords, there is one fundamental law; the longer the cord, the heavier the gauge. That’s why a 100ft. cable requires a gauge 10 (extra-heavy duty) wire while a 25ft cord will work fine with a gauge 16 (light duty) cord. But despite that, you also need to be careful about the recommended amperage of each. This is because, the more the amperage, the heavier the gauge. Are there chainsaws for left-handed? No, there are no chainsaws for left-handed people; whether a gas chainsaw or electric. First, there are very few left-handed people compared to the right-handed, so that means there is no market for left-handed chainsaws. Second, left-handed people adapt to the standard chainsaw design easily. Does my electric chainsaw require oiling? Yes, the electric chainsaw requires regular oiling on the guide bar and chain. It doesn’t need engine oil, however, like the gasoline chainsaws. Make sure to use the recommended adhesive chain oil as the regular synthetic oil is ineffective, forms hard substance on the bar and is harmful to the environment. Do electric chainsaws require sharpening? Yes of course. Electric chainsaws depend on the chain for cutting, and it needs to be sharp always for smooth cutting. After sharpening it severally, you will be required to replace the chain with a new one. Note that the chainsaw will require sharpening subject on the wear and tear. If you use it occasionally, you don’t have to worry about a blunt chain. Another thing, there are some models with self-sharpening chain bars, so maintenance is cut down drastically. Can you change the bar from 14-inch to 16-inch? Many people would wish to change the bar of their chainsaw, maybe from a bigger bar to a smaller one or vice versa. Well, while it is possible to swap bars, it’s important to check the specifications of the chainsaw as not all of them allow bar swapping. Even if they allow, make sure to use a recommended bar. STIHL, for example, recommends a 12 – 16-inch bar for MS 170/171, MS 180/181, MS 192 and MS 211. 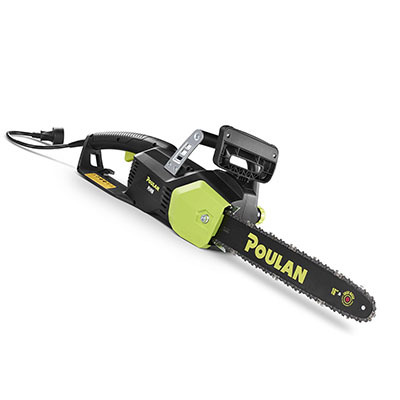 Poulan PL1416, on the other hand, is a model that can work with a 12-inch bar as well as a 16 and 18-inch bar despite being a 14-inch chainsaw. What is the best electric chainsaw brand? You will agree with me that the chainsaws market is flooded with hundreds of brands. In as much as you know buying from top brands is a great idea, identifying those top brands may be the challenge. For me, Husqvarna, STIHL, Makita, Bosch, and Dolmar are among the top brands. STIHL happens to be the first brand to sell electric chainsaws while Dolmar is remarkable for delivering the first gas chainsaw. 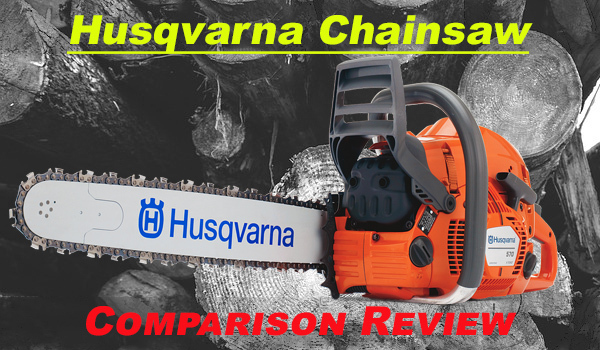 On the other hand, Husqvarna is now the most popular chainsaw brand globally while Makita Black & Decker and Bosch have curved an excellent reputation in the manufacture of reliable power tools including chainsaws. There are a few other notable brands like Remington, WORX, Ryobi, McCulloch, Poulan, GreenWorks, Oregon, Einheill among others that should also be on your radar. How much do electric chainsaws cost? 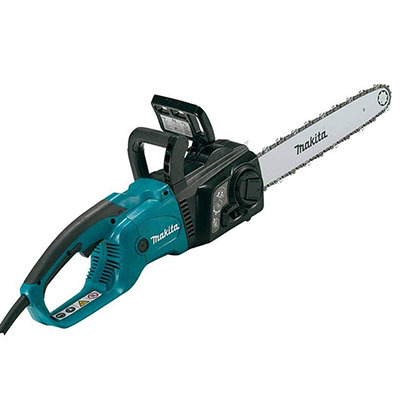 There is no fixed price for electric chainsaws because different aspects determine the price points. 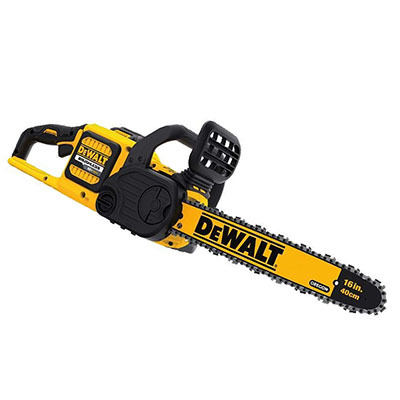 Prices range from $50 for the cheap light duty electric chainsaws to $800 for the heavy duty models. While the brand is a great determinant of the price, the duty rating is the most dominant dynamics. The more powerful a chainsaw is, the more expensive it is. In the same token, the top brands attract higher price tags. There can also be a deduction when it comes to cordless vs. corded electric chainsaws. Generally, the corded chainsaws are more expensive than the cordless type. But don’t be attracted to the latter because of the cheap price tags. Their power is lower, and the batteries don’t last long, so that means lesser productivity. If you want a reliable cordless electric chainsaw, set a budget if around $200. With this budget, you can snap something like GreenWorks 20312 or Black+Decker LCS1240 which are some of the best battery chainsaws. On the other hand, if you want a high-performance chainsaw for home use, a corded chainsaw is the best. Some of the best models, the likes of Makita UC4051A will set you back an average of $300 give or take. But don’t be too rigid, there are a few other models you can get for lesser. Where do I buy electric chainsaws, parts, and accessories? Well, many local stores sell chainsaws. Some are your ordinary retailers while others are appointed dealers. If you opt to buy from the local stores, I recommend the appointed dealers because of the after-sales services. It’s easier to get feedback regarding warranty from an appointed dealer than just any other dealer. Parts are also readily available at appointed dealers and so is technical support. For me, I prefer doing my shopping online because you get variety and competitive prices. Online stores like Amazon bring many sellers on one platform and among them, there’s great competition and price is among the things that win the war. Do some window shopping at your local dealership and compare with the prices of online stores. The latter offers the best deals as well as variety not to mention the convenience of delivery. But for parts, it’s better to get them at your local dealer as the price difference may not be so big. Instead of postponing work because you are waiting for Amazon, just get a quick replacement and get back to work. Are second-hand chainsaws worth it? You may find yourself with a limited budget so second-hand chainsaws might seem to be your rescue. However, we strongly discourage buying second-hand chainsaws especially the gas chainsaws. Unless you can disassemble and assemble the engine yourself, buying a second-hand chainsaw might be the beginning of endless trips to the technician. One problem with second-hand stuff is that you don’t know the reason it’s being sold. You will be lucky to buy a second-hand chainsaw that is in excellent condition. We’ve come to the end of our review folks. I’m sure you are now ready to make the best purchase decision if you were not sure which electric chainsaw fits your needs. Indeed, there are a lot of things you need to consider; from your user experience to the performance of the chainsaw and also how to be on the safe side. 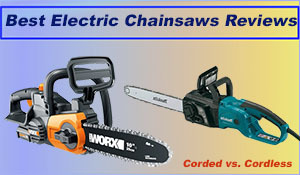 What’s your favorite choice; is it a corded chainsaw or the cordless? Tell us in the comments section and also, don’t forget to tell us your best model and why. If you like our article, please rate it. 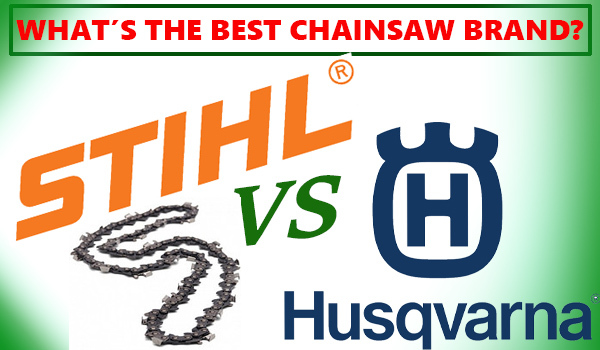 STIHL vs Husqvarna; What is the Best Chainsaw Brand?